Well, not completely axed. 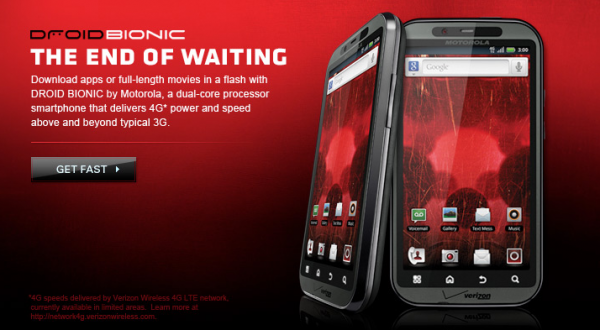 If you stop by Motorola.com, you can see the image we featured above, but clicking through just takes you to a generic mobile phone page with no mention of the DROID Bionic. You can even try using Google to find a cached version of the old Bionic spot, but you’ll likely come up empty unless you do some serious digging. Here is the link to the previous page for it. It’s gone, right? It looks like we are officially in “enhancement” mode then. And as we pointed out last week, the device was originally scheduled for a May 12 release, but after rumors of it being cancelled in favor of the much beastlier Targa surfaced, we knew this day was coming. So wave goodbye to the Bionic you are seeing above, as you will be introduced to a much different version by this summer. Something semi-similar to this, but hopefully with some of that original Bionic look.